In 1977 the Brothers Hildebrandt made a name for themselves in the Sci-Fi world by creating the movie poster for first ever Star Wars film. “Star Wars – A New Hope” completely changed the landscape for not only science fiction, but for the film industry in total. 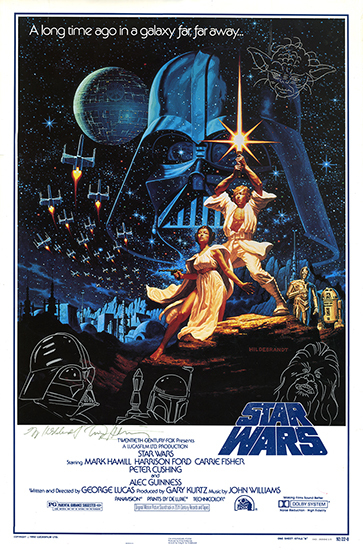 For its 15-year anniversary this piece was created, by Lucas LTD. And Killian Enterprises, using the imagery of the original Star Wars marquis painting. This piece, which is signed by both Greg and Tim Hildebrandt, has an additional 4 remarques (hand drawn head sketches) by Greg.